This cheerful, third floor Kiawah Island oceanfront vacation rental, located at 4429 Windswept Villa, offers beautiful views from the main living areas and master bedroom. 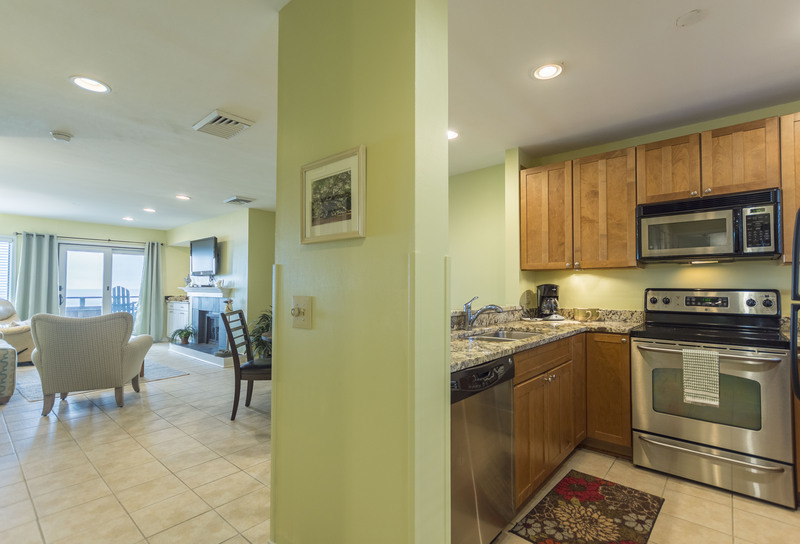 The fully equipped kitchen with granite countertops, stainless steel appliances, and nice wood cabinetry offers an open feel and views to the living area and ocean which will make preparing your meals during your stay a pleasure. The living area offers ocean views where you can sit and relax on the sofa, cozy chair, or leather recliner while watching the wall mounted flat screen TV with built in DVD player. The window seat with cushion and throw pillows makes the perfect spot for enjoying the views, sipping your morning coffee, or reading a good book. The living area also has a small bar with granite countertop and cabinet space where you can mix your favorite vacation beverages as well as a round table with four cushioned chairs for dining. Sliding doors lead from the living area to a small balcony with two chairs and a side table where you can watch the waves roll in and soak in the sunshine. The master bedroom has amazing Kiawah ocean views, a king bed with wicker headboard and elite pillow top mattress, a reading chair, and a wall mounted TV. 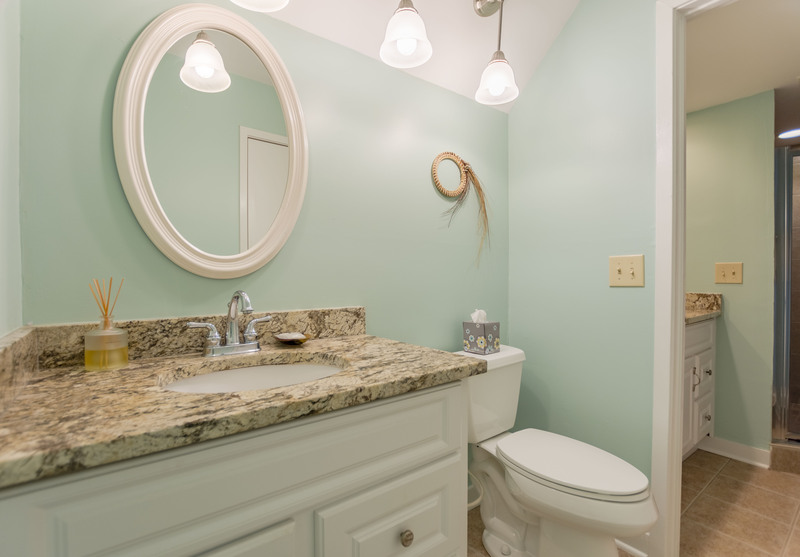 The bathroom, which you can access from the bedroom and the hallway, has been refinished with new sinks, granite countertops, a large tiled shower with a hand held spray and regular shower head and two corner seats. This villa comes with a washer and dryer and wireless high-speed internet access for our guests. Our first time staying in a high rise condo and we were impressed. Very nice unit itself, but the view was spectacular! Fun to watch the deer and the dolphin from our balcony. The unit was nicely done and well equipped. Great location and view. Really enjoyed the bike trails - we rode from one end of the island to the other. Apartment is well laid out for a couple. First time visitors attending a Mid-December wedding. Loved the island, the condo and all of the amenities. Everything you need is nearby; you don’t have to leave the island. Condo is just right for a couple's getaway. Double sized shower, lots of drawer space in baths & bedroom, large walk in closet, comfy king bed, and separate 1/2 bath give it perfection. Thank you for providing extra towels and pillows. Could use a pair of tongs in the kitchen. Otherwise, all well-equipped. Will definitely plan on coming back. Hi Lois, We would be happy to provide tongs. Thanks for letting us know! We are former residents of Kiawah. When we visited recently 4429 Windswept Villa was our home for a week of renewal and memories. This villa is well designed for two people, bright, clean and well-equipped. We are well-satisfied. We stayed at this property last year in February and were happy to return to it this year. It is a perfect location-easy access for walks on the beach and to bike trails, as well as for a walk over to East Beach for a sandwich. Kitchen is well equipped and property amenities such as beach chairs made our stay quite enjoyable. Quiet, convenient, restful retreat. Great ocean view. Beautiful beach. Very comfortable and well kept condo. Great ocean view. Great experience with Akers Ellis. Easy to contact and seamless arrival and departure. Our condo was well appointed with some of the best views on the island. Would highly recommend Windswept 4429. Weather was somewhat iffy but it was spring and it did not stop us from a restful time! Everything as expected. Fourth time at this site. This is our third time staying here and it is always enjoyable! The condo is clean, beautiful and convenient. The ocean view is amazing. 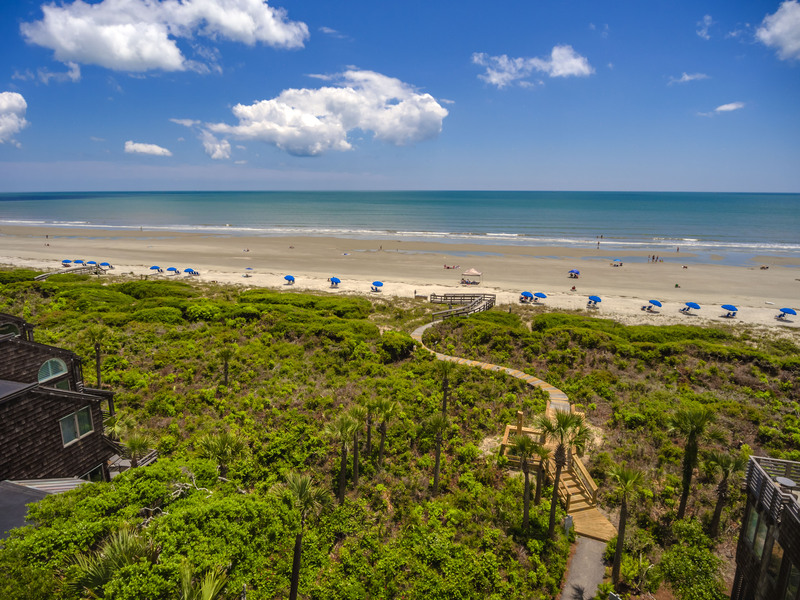 We love everything about Kiawah and staying here! Perfect experience. The view says it all! The villa was well furnished,kitchen was well equipped, and overall ...comfortable. The 1 and 1/2 baths work really well. Beautifully appointed and furnished villa with a fantastic ocean view. Very clean and nicely decorated. definitely a home away from home. quiet and peaceful on Kiawah Island. Especially loved hearing the ocean-something very peaceful about the sound and sight of it. The patio and the reading nook in this condo were my favorite spots to be. Very nice updated kitchen and the bed was very comfortable. Lots of trails to walk/ride a bike on. I would return in a heartbeat!! Wonderful!! So glad to hear that you had a great time. We look forward to hosting your vacation in the future! Great ocean views. Quiet. Everything we needed for a relaxing vacation. We love the Windswept and have stayed in others but this one is the BEST... great value, loved the ease of rental, the location, everything was so convenient, clean, beautifully decorated and relaxing! The deck/patio view of the ocean was great - best patio furniture!!!! We will definately be back and recommend to others! We thoroughly enjoyed our 2 week vacation on Kiawah. We believe it's the most beautiful beach we've ever been on. It's so relaxing, not crowded and surrounded by nature. All the restaurants are fantastic, and the shopping at Freshfields offers all kinds of great items. We've been going to Kiawah for 30 years. For the last few years, we've used Akers & Ellis for our villa rentals. The villas always look just like the pictures, and if there's anything needed, they are always accommodating. We will continue to rent with them, and refer them to friends and family. Very happy to find a one-bedroom ocean front property. I was more than pleased.The premises were clean, well maintained , equipped and wonderfully located with an ocean view and immediate access to the beach.Nice! Every as expected. Repeat visit to this condo. Fantastic... very enjoyable & relaxing. Food was delicious at Ryder Cup Bar, Lokal, Cantina 76, & the breakfast buffet at Jasmine Porch was unbelievable. 4429 Windswept Villa is a nicely furnished, updated 1-bedroom condo, perfect for a couple's getaway. We loved sitting in the chairs on the little balcony overlooking the ocean. This condo is on the third floor of a large building; if you are on a lower floor, views of the ocean are impaired by dunes and bushes, etc., so third floor is ideal. The condo has ample seating in the living room (a nice couch and a couple of chairs, plus a window seat! ), a t.v., a eating area as well as a fully equipped kitchen. Washer and dryer worked well. Bedroom and bath were very nice. Absolutely NO complaints! Great place for a getaway! Our first time staying at Kiawah on the ocean in February and just the 2 of us! We have been visiting the island since 1996 with our kids and then with our granddaughters! We loved everything about 4429 Windswept! It was everything we needed especially the view! Mornings watching the sunrise on the deck were Awesome! Listening to the waves so peaceful and relaxing! We rented bikes for the week, rode to the Ocean Course, river and on the trails where we seen several alligators! Ate at some fun restraunts The Tattooed Moose, Krazy Owl, Reds Ice House on Bohicket and Laddels at Freshfields! Made a day trip to Charleston and had great bbq at Queology on Market St. A visit to Firefly Distillery is fun time! I especially enjoyed sitting with a book in the little reading nook with an ocean view! We will definitely be back but will need more time a week goes way too fast! This is the 2nd time we've stayed at 4429 Windswept. We were there two years ago and liked it so much that we wanted to stay there again. The location is fabulous. We LOVE the way it's decorated inside and esp. the deck that's almost on the beach as well as the huge shower. We appreciated the instructions on how to operate the TV and DVR too - very thorough and easy to follow! The air conditioning worked great - the A/C in other units doesn't always work very well, so we appreciated this one having fabulous A/C. My husband and I have been going to Kiawah to vacation for over 30 years and have stayed in a number of Windswept units in that time. This one is probably the nicest one-bedroom we've been in. Thanks for everything. We had a fabulous, memorable week on Kiawah and look forward to coming back again. We really enjoyed our stay on Kiawah! We appreciate the way you answered our issues and your quick time of response! We had a wonderful time. The weather was great, the food was terrific, the unit was nice, and the beach was perfect. Hopefully we will be back next year. Our stay was wonderful. The place was clean and very comfortable. We would definitely stay again next year. We were very pleased with our vacation rental. It was beautiful and the view breathtaking!! This was our first visit to the island and we really didn't know our way around. Our neighbors were helpful! We truly hope to have the opportunity to visit again and will definitely keep your information for future reference. We really enjoyed our time at Kiawah. I was there to do the marathon and was well pleased with the location and proximity to the start/finish line. The unit was well equipped and well kept and the view was super. It was a 4 star stay. Linens and bath amenities were deluxe. Kitchen was well supplied. Housekeeping was excellent. We had a great time, and Kiawah serves as such a nice quiet retreat from the city life we live here in Charleston. First, your company was fantastic to work with, very informative and everything was delivered as promised. The condo was lovely, an absolute beautiful setting right on the water, and very well stocked with the necessaries of life. We had an excellent stay and hope to rent the condo again next spring. We had a wonderful visit, and were very satisfied with the unit. We really appreciated the decent pots, pans and dishes in the kitchen. Many rentals stock unusable items in their units, so we were pleased to be able to really cook while we were there. All in all, a very comfortable unit and the view was spectacular! We’ll definitely be back. Location is wonderful. The window seat was really appreciated. It was occupied most of our visit. Kitchen was very well equipped. Alligator bike rental was great. Lots of towels. We made good use of the lawn chairs in the closet. Really appreciated the washer/dryer. Check in and out is astonishingly easy. We will be very likely to return because of the places we have been in the south, Kiawah is really the most beautiful. This was our second visit to Kiawah, and the second time at 4429 Windswept. We enjoyed our second visit just as much as our first, and rate our visit as a strong 5. We had an awesome stay. Thank you! I would rate our overall stay at Kiawah and 4429 Windswept Villa as a 5. We had a wonderful time and will return. We were very happy with our stay, and the 1 bedroom worked out well for us. We would consider coming back to the same complex in the autumn. The view is awesome!!! The place is well decorated, and suited us perfectly. We will contact you in the future. We loved the Windswept Villa and loved Kiawah Island. Money-wise, it was a stretch for us, but it was worth it. We loved our stay - thanks!! My husband and I have stayed in this Windswept unit several times in the past. We love the unit - its location and how it's decorated with the updated kitchen and very large shower area. The deck is great - overlooking the ocean. We loved our stay on Kiawah and will definitely come back again. Your agency is great to work with as well. Thanks for doing such a great job! Our stay was a 5! Hope to visit again in the future! I love how easy Akers Ellis makes it to go in and out of the rental with the app. I would suggest that the villa owner put a fresh coat of paint in the villa but other than that it was comfortable and I loved the location and view! The unit was very nice. The mobile app you provided was fantastic. We arrived after sundown and the app was very helpful navigating around the island. It was so dark it made finding the unit and restaurants very easy. Great location, ocean front deck was enjoyable, elevator worked well. We had such a lovely stay at our rented condo. It was very homey feeling, yet clean and obviously well cared for. I have stayed in many different rentals on Kiawah and in many ways, this was the best; simple, yet everything we needed was provided. All in all, you have done a great job and we really appreciated our time with you! Just as promised the villa was great. The villa was very clean and updated. Beautifully decorated. Great location close to the beach. Property management company does a great job. We enjoyed our stay very much. The condo was in excellent shape. Our overall satisfaction rating would be a 5. It was our first trip to Kiawah Island and we really liked the area. We had a great trip this time. The rental was wonderfully located, and the weather was remarkable. I can say with a good deal of certainty that we will vacation in Kiawah again. The rental experience was pleasant and easy! The view was amazing. The condo was in good condition. Needs a good dusting. We have been coming to Kiawah for 25 years, staying at different condo's in Windswept. This one did not disappoint us. We felt like home. The breaker at one bathroom sink was tripped several times by my wife's hair dryer. Not sure why. We frequently ran out of spoons and had to wash some. Not a big deal but a few additional spoons would have been nice. Both of these are comments are offered in the spirit of helpfulness not as criticism. As I said, it is a very nice condo and we had a great time! Fabulous unit with perfect views of the ocean. This unit is updated and feels like home. The views are incredible. We enjoyed seeing the deer on the ocean, the sun rises, sun sets, and hearing the sounds of the ocean. 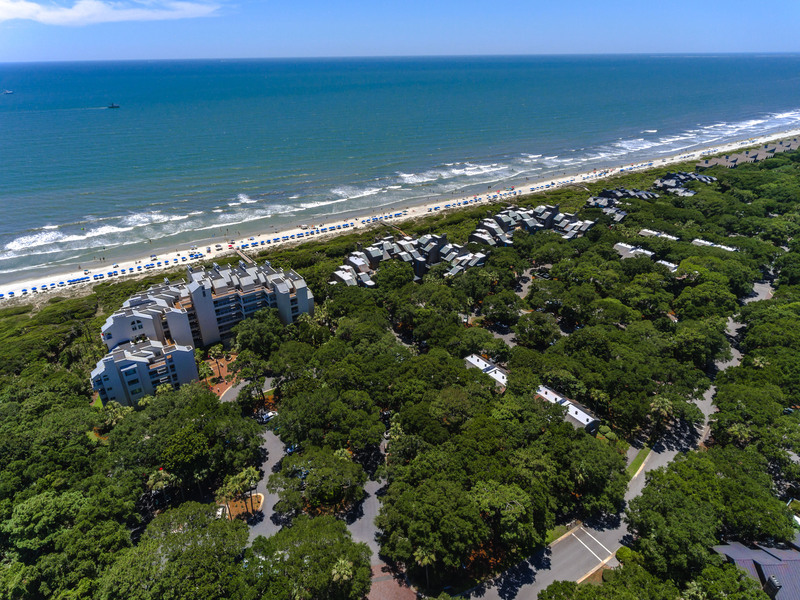 We would definitely recommend this unit to anyone that wants a great Kiawah experience. Rental was in a nice location in Windswept and the window seat was wonderful for reading and listening to the nearby ocean waves crashing on the beach. One of our favorite properties! This is our second year renting this property and found it to be perfect for my wife and myself. It very comfortable with a good view of the beach,convenient to the Spa and all of the golf courses. I will infinitely rent this place again. Went in February for husband's 35th birthday. Great villa for two people. Enjoyed the reading nook and the double-headed shower! The kitchen could be better equipped. When asked, you did bring over a cutting board. However, it would be nice to have a rectangle pyrex casserole dish, a large salad bowl, trivets, white wine glasses. The decor was lovely, and the location could not have been more perfect. Our experience was wonderful. The ease of reservations, the quick answers back on all my questions, and the quality and location of the villa was all fantastic. We would definitely stay here again, and hope to in the future. The accommodations could not have been better - right on the beach, full kitchen, washer and dryer in unit, and the balcony was the favorite place to be. We can't say enough about how much we enjoyed this property - the location, its amenities, and, of course, the view - was outstanding. This property is wonderful. The atmosphere was very peaceful and relaxing. It had all the ammenities and a perfect view. We WILL return. This is a lovely condo located right on the beach. It is walking distance to Night Heron Park, the Sanctuary and East Village. Askers recommended rental companies for bikes and beach chairs/ umbrella. No problems with their recommendations. The kitchen is sparsely appointed. It could use some Pyrex storage dishes or tupperware (something with a lid). Bring your own blender if you want smoothies or mixed drinks. A folding card table would be nice for doing puzzles. My husband and I have stayed at Kiawah 4 years now. Three times with different properties at Windswept. This condo is our favorite. The furniture is very comfortable as was the bed. Views from the living room and bedroom were just fabulous. The large walk-in shower was wonderful. I am unable to be in the sun during the "heat" of the day, so this balcony is perfect. You can be out there almost all day without the sun bearing down...yay! Just a short walk to the beach so no complaints. The kitchen was really pretty with granite and new cabinets. I would have liked a bit more glassware - only two wine glasses, but we made do. The elevator died our last day there - if something like that happens when you visit - call Akers - not the resort. We called the resort several times only to later find out they are not responsible for these properties. Akers would have been much more able to help had it not been 5 on Friday evening when I realized no one was going to come fix it! Akers even offered to help with getting our luggage out the next day! Other than that - it was fabulous and we will return next year! We'll be back soon. I miss my ocean view! The view was beautiful and the condo was wonderful. We saw baby turtles being released into the ocean and dolphins stranding on the beach to eat!!! The pull out bed was extremely uncomfortable for our son to sleep on, but he dealt with sleeping on the couch itself. loved it, loved it, loved it and would love to come back. We enjoyed our vacation at the villa. It had everything we needed including a great view. Everything went smoothly and we had no issues with the rental process. Thank you so much for your feedback. We are very happy to hear you enjoyed the villa and had a great time. We always have a wonderful time at Kiawah. I would rate Akers Ellis a 5 for it's customer service, we really like that you send the gate pass and key information so that we can go straight to the villa without having to stop by some place to check in. We've stayed in the villa a couple of times over the past couple of years and it's starting to show a little wear. Other than that the place is clean. We will be looking around the Aker Ellis site to plan our next trip in November. We enjoyed our stay at 4429 Windswept. We called Akers Ellis with an electrical issue and they handled it immediately. We appreciated the courteous manner of your staff. We liked the location of the villa. This is our second stay in this rental. The condo was clean and had a fabulous view of the beach; it was a short beach walk to the Sanctuary. So we were able to enjoy fantastic meals, a great view and had fun riding bikes. Thank you for a nice weekend getaway. It was very clean and beautiful. Look forward to next time! We really enjoyed it, just wish the weather had been better! Thank you! The condo itself, the furnishing and the view are definitively a "5". We had a great time at Kiawah and enjoyed the villa. Everything was as expected and the lock box system is great. I like smooth and easy check ins and outs and you nailed it.